Sgt. 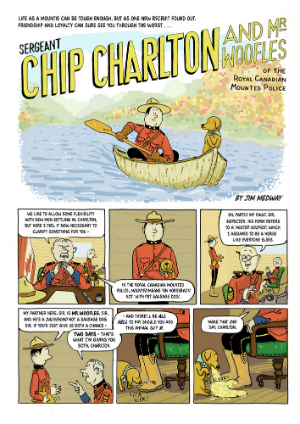 Chip Charlton and Mister Woofles is a book that will genuinely appeal to all generations of comics readers. I’ve made this statement to the point of tedium here at Broken Frontier but I firmly believe that if we’re going to use a term like “all-ages” to describe a comic then it should mean “all-ages”. Not simply a book that is targeted at younger readers but one that has an appeal whatever your age because it works on different levels for different reader demographics. Jim Medway’s Sgt. 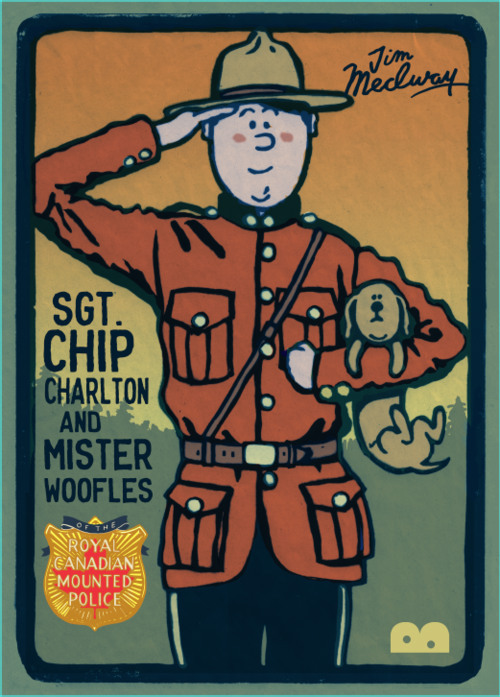 Chip Charlton and Mister Woofles of the Royal Canadian Mounted Police (from hereon that title will be abbreviated to Sgt. 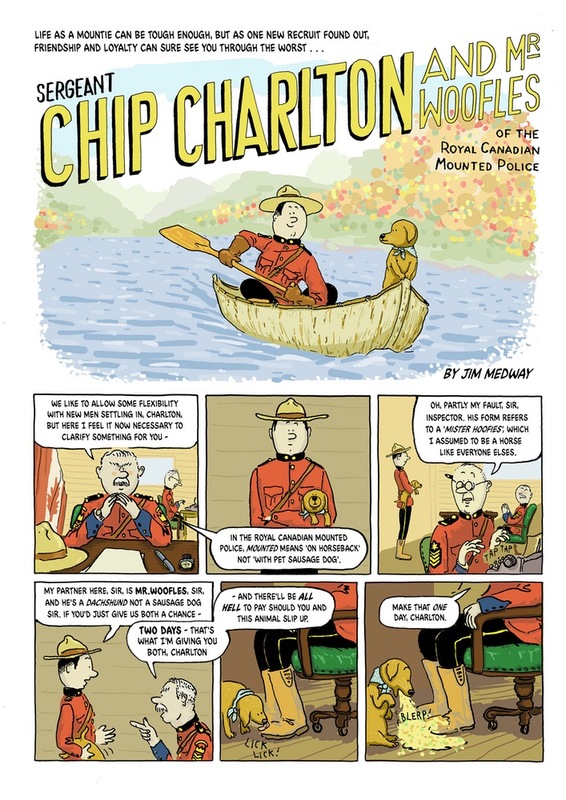 Chip Charlton and Mister Woofles in case my fingers start bleeding from over-typing) is one such title. If you’re a kid you’ll love it for its madcap silliness and moments of slapstick grossness. 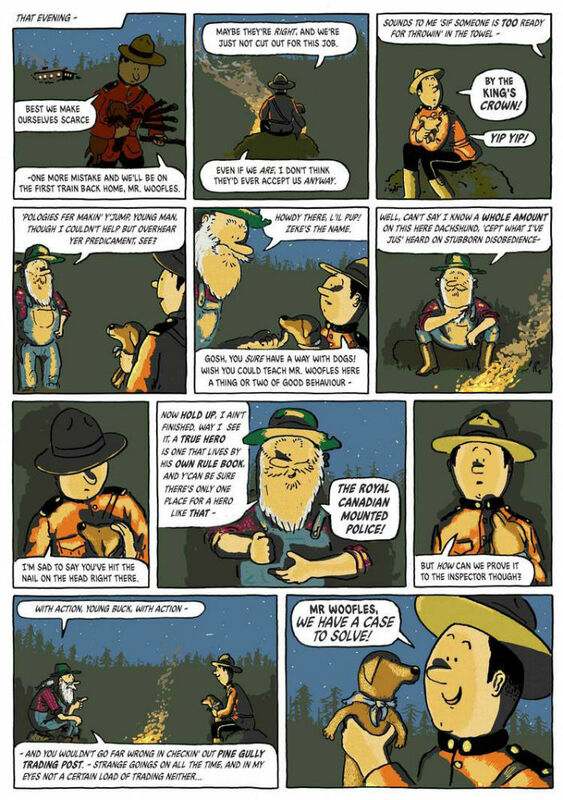 If you’re an adult then its send-up of a long-gone era of more earnest “adventure stories for boys” in a Viz-lite kind of way will keep you equally amused. Sgt. Chip Charlton and Mister Woofles was originally published in the pages of that splendid British weekly comic for kids The Phoenix. This collected volume of artist Jim Medway’s strips comes to us courtesy of Bog Eyed Books, the new imprint from UK cartoonist Gary Northfield (Gary’s Garden, The Terrible Tales of the Teenytinysaurs) which is also bringing his much loved Derek the Sheep back into print. 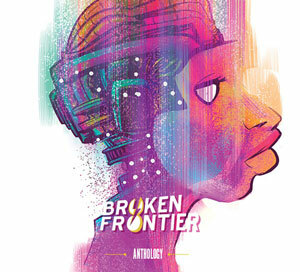 It’s been a long while since I’ve covered Jim Medway’s solo work here at Broken Frontier. If memory serves that was in the pages of Playing Out – a slice-of-life tale of hazy, childhood days of idle leisure that was surely one of the most under-rated titles to come out of Blank Slate Books over the years. Sgt. 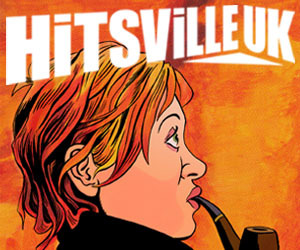 Chip Charlton and Mister Woofles is a very different beast but what it does share with that BSB offering is Medway’s expressive cartooning style and engaging visual characterisation. Medway gives us a leading man who is, appealingly, both heroic and clownish and a doggy sidekick whose unfortunate spew-inspired antics will delight a younger audience. Most of the strips in these pages are two-parters consisting of 3-4 pages per instalment that employ tight-panelled pages, sometimes surprisingly convoluted mini-narratives, and epic derring-do on a cinema serial scale. 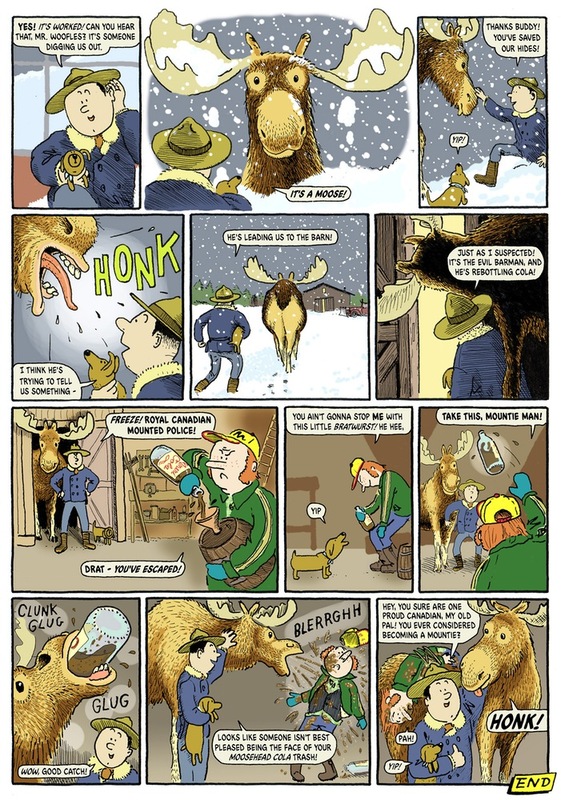 The humour is richly drawn from the juxtaposition of the sometimes po-faced, altogether-too-serious-for-his-own-good but always endearingly well-meaning Chip Charlton with the utterly preposterous schemes and situations he gets himself pulled into. Charlton is a likeable lead for his fierce loyalty to Woofles and his ability to blunder through his own exploits as ever escalating chaos envelops him. The whole affair has a knowingly retro feel to it; its parody almost conspiratorial in tone as creator and reader alike revel in the sheer ludicrousness of the comedic set pieces. 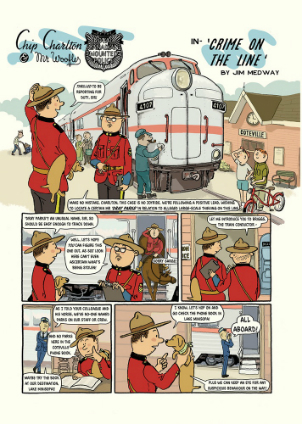 Medway’s art has an accessible clarity but his pages are also densely packed with an engaging use of colour and a noticeable sense of energy to his panel-to-panel storytelling. With Bog Eyed Books bringing some of Northfield’s own much loved work to new audiences we can only hope that it proves enough of a success to also provide an expanding publishing platform for other creators like Medway in future. At just £6.99 this is a steal in terms of cost for a book that will genuinely appeal to all generations of comics readers. Order the book online from the Bog Eyed Books store here. Staff Picks for July 25, 2018 – The Beano, Descender, Royal City, Derek the Sheep and More!